Designer decorated, high-end home with gourmet kitchen & gas fireplace. Quick walk to the slopes. Great location , great house. Would like to see more cooking essentials updated but understand being a rental house. Everyone we dealt with at Latitude 38 was professional and went above and beyond to make sure our needs were met during our stay. We will certainly use your services again in the future. I LOVE Latitude 38 rentals! The properties are very nice and well decorated. The staff is extremely friendly and helpful. 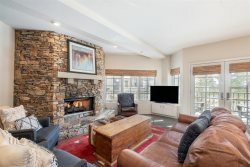 I doubt we will ever use another vacation rental when visiting Telluride. I HIGHLY recommend them!! Property was beautifully decorated and exactly as described and seen in pics! Location was great! Easy access to all of town, including gondola and lifts. Will stay again! Thank you for all of your help recovering my credit card that I forgot @Oak! It arrived today and I could not be more grateful for your help. The property we rented was in a great location and beautiful. We felt like we were at our home away from home. Very clean and so many amenities. Thank you for making us feel so at home. We have used Latitude 38 numerous times over the years for our vacation rentals - always with excellent results! The properties are beautiful and well-cared for, the staff are very pleasant and accommodating, and our expectations are always met! Our overall experience has been excellent for several years- keep up the great work! We left a bag and Allison went to the property and took our bag to Federal Express and shipped to us in Crested Butte. Excellent client service. Thank You. Beautiful home with great amenities. The location is great!